A small company, started with the help of four mums, is about to change life with a baby in a big way. We at Babyology are so excited to reveal the all-new, updated mamaRoo infant seat. 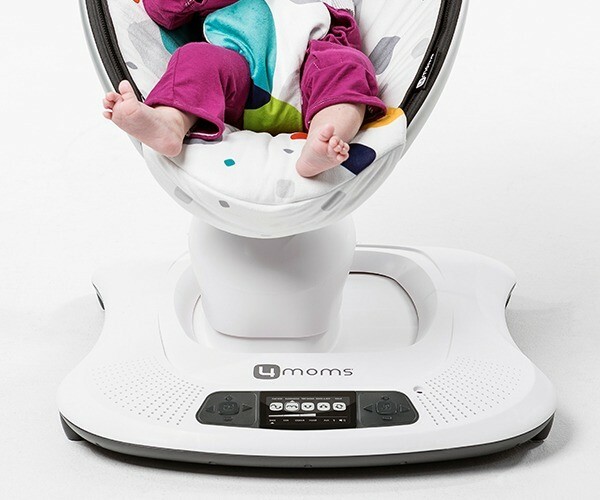 Get ready – this mamaRoo is a game changer for parents everywhere! You know that rocking, swaying, bouncy jiggle that you tend to do any time a baby is in your arms? Sometimes you may do it when you aren’t holding your infant and without even realising it. Well, guess, what – the masterminds behind 4moms have mimicked this motion in their mamaRoo infant seat. Parents across the country can give their arms a break, refrain from the constant jiggle and… wait for it… make dinner with both hands! Because the mamaRoo moves like we do. 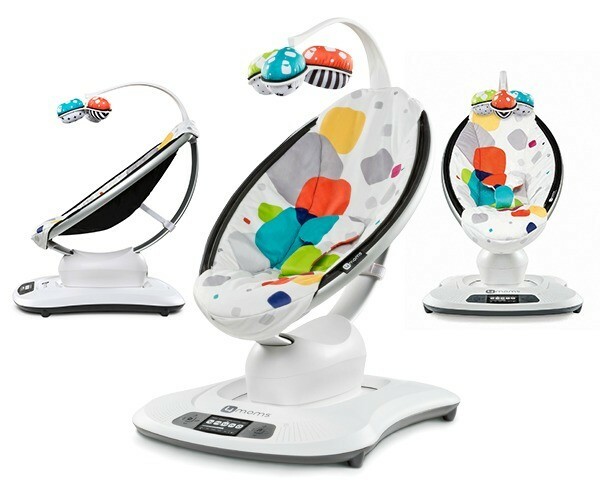 It bounces up and down, sways side to side and is one of the most advanced infant seats we have ever seen. Most babies have a preferred movement that helps them relax and lulls them to sleep. As parents, it is our duty to find this motion. For some babies, it’s the car – the bumps and turns can be an instant sleep cue. For others, it may be a swing – the rhythmic sensation can make it hard for even the fussiest newborn to stay awake. 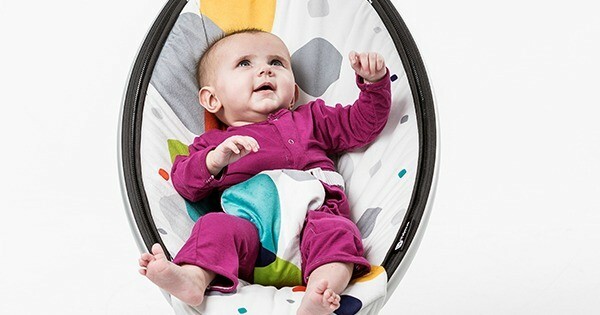 The mamaRoo allows you to choose the speed setting and motion based on your infant’s preferences. There are five speeds and motions to test out, including rock-a-bye, kangaroo, car ride, tree swing and ocean. Then choose from four built-in sounds or connect to an MP3 player via the included adapter to ensure your child nods off in no time. But the mamaRoo isn’t just a sleep inducer- the seat reclines to multiple positions to allow baby to lie back and relax or sit up and play. 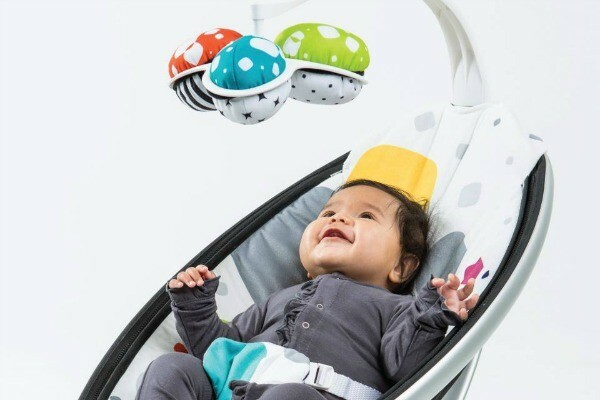 The bouncer includes a bright overhead toy mobile and removable toy balls designed to help develop your child’s cognitive skills. What we especially love about the mamaRoo is it has been crafted from experience and the mums behind the mamaRoo have considered everything. The frustrating things about having a bouncer or swing, like running out of battery power or having to constantly get up to change the settings, are no longer an issue. The mamaRoo comes with an AC adapter (no batteries required) and a blue backlit LCD display screen. Plus, the new mamaRoo is now Bluetooth enabled so you can control the motion, sound, speed and volume from your phone or any smart device. You can even play your own music, provided your device is compatible with the 4moms app (available for purchase separately). And we cannot look past the three-point waist and crotch harness for extra safety, the adjustable seat recline for additional comfort and the removable, machine washable seat covers for minimal fuss when cleaning. 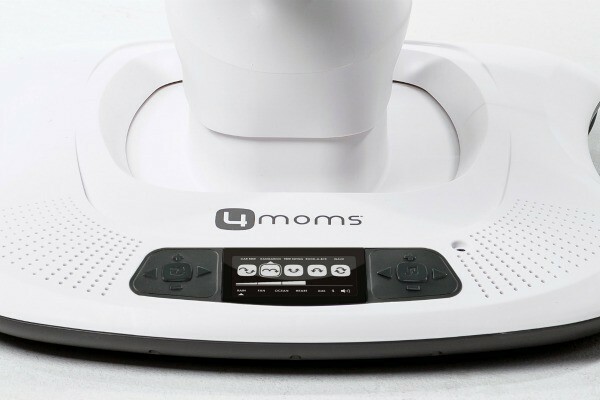 4moms know exactly what it’s like to have an unsettled newborn and a house full of equipment designed to help. They have used their experience to create the master of all infant seats and we’re impressed! You can find the mamaRoo infant seat at any speciality baby retailer across the country for $599.99 recommended retail. The mamaRoo infant seat may be your ticket to hands-free (and jiggle-free) time, your baby sleep solution and your new best friend. Sure, your arms may not be as toned, but your sanity will be intact.